There is already news of the persecution of what the world calls Jews, those who celebrate the Fourth Commandment on the Seventh Day of each week. Jew is a false word. It was invented to hide who the roman catholic church hates and has tried to rid the world of for many years. You need to know the Prophecies written by Yahweh’s Prophets are 100% accurate on foretelling the moves of the nations and religions today. They do not whitewash or, in anyway, cover up the Truth. If you will read these Prophecies and compare them with today’s activities of the nations and religions, you will see, in advance, what will take place next and the end of the governments now ruling the nations, multitudes, and peoples by force. The holocaust for this present prophesied time period, called The End, by Yahshua Messiah, also called the Last Generation, meaning the last generation allotted to mankind, saying it will end with a widespread holocaust that will involve all nations in nuclear burning that will also darken the sun. The Prophecy Yahshua gave is also very believable, for the fact that much of it has come to pass already, in that we do have nuclear bombs that can darken the sun, as scientific tests have shown. Others of Yahweh’s Prophets show the earth will be burnt and few men left. The start of the nuclear bombs was in 1934, which is also the time period of another Prophecy showing that knowledge would be increased in that precise time period. But you, O Daniyl, shut up the words, and seal the book to the time of The End; many will run to and fro, andknowledge will be increased. That, too, had its beginning in 1934. Remember the date 1934. This date plays a big part in Prophecy and history. The holocaust did not originate in Germany. However, due to the news of the mass slaughter by the ‘Jew’ named Adolf Hitler in Germany, the world finally found out what had been going on for thousands of years, but it was only supported by gossip here and there. Yes, Hitler was a ‘Jew’ who killed ‘Jews’ for the roman catholic church. The fact is, there were murders and mass murders taking place all over the world for the same reason they took place in Germany. But those murders did not start in Germany. We see the start of the murders and the cause in the very beginning of man’s history. From there we can trace those events and the cause, not only in the history books, but in the most reliable history book ever–the Inspired Scriptures, The Book of Yahweh,written by Yahweh’s Prophets and the twelve Disciples of Yahshua Messiah. The cause is shown for the first time in the bible in Genesis Chapter 3 where mankind is shown to have given himself over to practicing sin. 7 Then the eyes of both of them were opened, and they realized that they had ksinned; they had lviolatedmYahweh’s Laws. Because they had nnot okept Yahweh’s Laws, they were pafraid. Notice the footnotes to verse 7.
l. (verse 7) Hebrew root word phar. Traditionally translated sewed. A Hebrew and Chaldee Lexicon to the Old Testament by Julius Furst, page 1157, shows this word is correctly translated violate a law. m. (verse 7) Hebrew world ol. Traditionally translated leaf. The Analytical Hebrew and Chaldee Lexicon by Benjamin Davidson, page 599, shows this word is correctly translated The Most High, Who is Yahweh. n. (verse 7) Hebrew article of negation la was left untranslated in Genesis 3:7. A Hebrew and Chaldee Lexicon to the Old Testament by Julius Furst, page 719.
o. (verse 7) Hebrew root word oshah. Traditionally translated they made. The Analytical Hebrew and Chaldee Lexicon by Benjamin Davidson, page 616, shows this word is correctly translated to perform. p. (verse 7) Hebrew harag. Traditionally translated coverings. by Julius Furst, page 485, shows this word is correctly translated A Hebrew and Chaldee Lexicon to the Old Testamentto be afraid. Now that you understand the mistranslations, for a better understanding read again Genesis 3:1-7. And Adam was not deceived, but the woman, being deceived, 1fell into sin. 1. Verse 2:14—Hebrew abar. The clause the woman, being deceived, fell into sin is saying that Eve, who was deceived by Satan (Genesis 3:13) provoked (caused) Adam (who was not deceived) to sin. Theological Wordbook of the Old Testament by Harris, Archer, and Waltke, Volume 2, Page 643. The first thing we see in this, one of many important lessons for mankind, is the ease in which mankind is drawn into sin. The second lesson shows the bitter impact sin has on people’s lives. After the parents, comes the bitter impact on the lives of their children. The practice of iniquity, which is the root cause of murder, started at that time and was picked up by Cain, who murdered Abel. Yes, sin leads to death, death by murder, anger, and hatred, which we see all over the world today. 7 If you do Righteousness, will you not be acceptable? And if you do not do Righteousness, sin iscrouching at your door. The desire to sin is with you, but you must overcome it! That practice of iniquity allowed Satan to institute continual war. Not as Cain, who was of that wicked one, and murdered his brother. And why did he murder his brother?Because his works were evil, and his brother’s were Righteous. Don’t overlook the emotional conflicts shown in Cain’s life. Psychogenics and psychosomatics are both fields of study into the entire actions of the mind, showing the disorders brought on or made worse by one’s emotional state. So, all the world, except for the Seven Prophesied Works of Yahweh, have gone the way of Cain. First off, this verse shows that these were children of the heads of Yaaqob from the twelve tribes of Israyl, whose fathers were brought out of Egypt by the hand of Yahweh, through the Work of Mosheh. Secondly, it shows they rebelled against Yahweh’s Laws of Righteousness, as did their fathers, the same as they do today. However, today they call themselves catholic and rule from the seven hills of Rome, to where they moved after they had their roman general Titus destroy the temple and move its artifacts to Rome. It was these heads of Yaaqob that continually fought against Yahweh’s Prophets and those who followed Yahweh’s Prophets. Which of the Prophets have your fathers, like Cain, not persecuted? 51 You stiffnecked; stubborn, and uncircum­cised in heart and ears! You do always resist Spirit Holy! Justas your fathers did, so you do also! … his brother’s were Righteous. They hated the temple for the same reason and they hated Yahshua Messiah. 51 You stiffnecked; stubborn, and uncircumcised in heart and ears! You do always resist Spirit Holy! Justas your fathers did, so you do also! Notice verse 52, like Cain; that is like the character of Cain, they persecuted and murdered those who practiced Righteousness. Remember, Genesis 4:6 shows the confused mind and verse 7 shows this hateful, confusion comes from the sinful life that Cain practiced, avoiding Yahweh’s Righteousness. This is the same lesson in psychogenics and psychosomatics that we see in I Yahchanan 3, showing why Cain’s characteristic confusion, as described by Yahchanan, brought about the murder of his brother. 35 This Mosheh whom they rejected, saying: Who made you a ruler and a judge? is the one Yahweh sentto be a ruler and a deliverer, by the hand of the Malak who appeared to him in the bush. 39 Whom our fathers would not obey, but they rejected him. So in their hearts they turned back to Egypt. Turning back to Egypt simply means turning back to the characteristic confusion of Cain and, incidentally, the whole world today. Whom our fathers would not obey, but they rejected him. So in their hearts they turned back to Egypt. Compare what we have learned already with what Yahweh’s Prophets and the twelve Disciples of Yahshua knew. In Acts 7:39, we see their hearts turned back to Egypt. The words hearts is word #2588 in Strong’s Exhaustive Concordance. Yahweh told Cain, as He tells us today, keep My Laws of Righteousness and you will become acceptable. Other-wise, sin lies at your door and you must overcome it (Genesis 4:6-7). Yahshua said the following about he who overcomes. …He who overcomes will not be hurt by the second death. How does one overcome sin that is always at the door? Start now to practice Righteousness. The catholics, as Cain, are still the same today. They practice rebellion against Yahweh’s Laws and persecution against all forms of Righteousness. The Apostle Kepha, whose name they changed to Peter, was not a catholic or a christian. Kepha taught and practiced Righteousness. Over the door of his house was a rock plaque with the Hebrews words Bayit Yahweh, which means House of Yahweh. Notice what he said to the pharisees, sadducees, essenes, and herodians who had the Laws and rebelled against them. They had Yahweh’s Laws of Righteousness and turned from them; they still do today. The very thing the Savior, Yahshua Messiah, the High Priest over The House of Yahweh tells everyone that they should seek first, and they refuse His Words; they reject Yahweh’s Laws. Yes! Read it for yourself in your own bible. What does all of this have to do with Ukraine and holocaust? Read on. The catholic church and all christianity teach ‘only believe’. They say they love the Savior, whose Name they removed from the Inspired Scriptures and replaced it with the names of two Gods of Egypt, and they reject His Words. Yes, they admit to changing His Name and the Creator’s Name, Yahweh. It’s in their own records. They practice sin continually and teach the same. They will not repent and convert, so their sins are not blotted out. The roman catholic church and christianity teach that the pharisees, sadducees, essenes, and herodians, whom they call Jews, kept the Laws of Yahweh and that the Savior abolished Yahweh’s Laws. The whole of which is nothing but lies, as the Prophets and the Savior, Yahshua Messiah, say. 14 I have also seen in the prophets of Yerusalem a horrible thing—hey commit adultery and walk in lies;they turn from Yahweh and follow after the Gods (elohim)! They also strengthen the hands of evildoers, so that no one turns back from his wickedness. All of them are like Sodom to Me, and her inhabitants are like Gomorrah. In this generation, the above Scriptures describe the teachings of the catholics and christians perfectly. The Savior said the same of the whole world. In the days of Noah, mankind was in the same condition they are today. 5 Then Yahweh saw that the wickedness of man was great in the earth, and every intent of the thoughts ofman’s heart was only evil, continually. 6 For they were acting defiantly against Yahweh because of the evil man had done on the earth, and they acted defiantly against Yahweh in their hearts. 12 So Yahweh looked upon the earth, and indeed it was corrupt; for all mankind had corrupted their way on the earth. 13 And Yahweh said to Noah: The end of all mankind has come before Me, for the earth is filled with violence through them; and they; mankind, have corrupted themselves with the earth. The world is totally cut off from Yahweh’s Righteousness in this generation due to the energy of Satan and the efforts of the pharisees, sadducees, essenes and herodians, now called catholics and christians. These are the fruits of the roman catholic church that we see being spread all over the world today–fruits of rebellion, shown by Yahshua Messiah. Mattithyah 7:17, the tree of evil brings forth iniquity. Genesis 3:5, the tree that makes you like the Gods brings forth evil. Mattithyah 7:19, the tree of evil will be cast into the fire. These were the violent men who took the temple by force. They took it by force, as they and their roman army have tried to take the whole world by force, murdering everyone who would not submit to God worship. They murdered anyone who practiced keeping the Seventh Day Sabbath. The crusaders were not the so-called Gentiles killing the so-called Jews. The crusaders were, and still are, the pharisees, sadducees, essenes, and herodians (the catholic church) killing those who kept, or tried to keep, Yahweh’s Laws. If a family would not eat pork, they were marked for death by those who followed the priest who ate pork. In verse 4, memorials to the dead is “All Saints Day” or halloween. Do you know anyone who keeps the memorials to the dead by celebrating “all Gods day”? Catholic means universal, which means they serve all Gods. The popes honor all Gods by teaching and practicing evil. All saints day means all Gods day. The roman catholic church fought against the True Saints of Yahweh and His Righteousness. Surprise! The Saints of Yahweh are those who keep the Commandments of Yahweh. Notice closely. They are not catholic and they are not christian. 18 And the nations were angry, for Your Judgment is come; and the time of the dead, that they should be sentenced, and that You should give reward to Your Servants the Prophets, and to all the Saints—to those who reverence Your Name, small and great; and should judge those who destroy the earth. 19 Then The House of Yahweh was made open for all to see in heaven, and the Ark of Yahweh’s Covenant was seen in His House. And there were lightnings, and voices, and thunderings, and an earthquake, and great hail. Here is the patience of the saints, here are they that keep the commandments of God, and the faith of Jesus. The roman catholic church and its army are those who make war against Yahweh and those who practice the Laws. Crusades have always been waged against all forms of Holiness. The practice of celebrating Yahweh’s set Feasts or weekly Seventh Day Sabbath, as stated in the Fourth Commandment, got millions of people killed. Read the Prophecy. Who does history show fulfilled this Prophecy? It was the pharisees, sadducees, essenes, and herodians, after they made their move to rome, gave their roman army the orders to destroy the temple. The chief priests, as their predecessors in Egypt, started again being called popes. They changed Yahweh’s Laws, forbidding the practice of the Fourth Commandment. With the roman catholic army, they murdered all those they could find who practiced this Law. The army also polluted and destroyed the temple that was once called the House of Yahweh. Yahweh’s Prophet Hosheyah shows clearly the actions of those now called catholic popes, who lead the kings of the earth from the seven hills of Rome. As you read Hosheyah 5:1-11, notice carefully how Hosheyah describes the confused minds of this violent world of hatred. 1 Hear this, O priests! Listen, O house of Israyl! Pay attention, O house of the king! The judgment pertains to you, for you have been a trap to Mizpah, and a net spread upon Tabor! 2 The revolters; rebels, are deeply involved in slaughter, though I have rebuked all of them. 3 I know Ephraim, and Israyl is not hidden from me. Now you, Ephraim, do commit whoredom; adultery of God (el) worship, and Israyl is defiled. 4 They will not direct their doings to turn to their Father: the spirit of whoredoms; idolatry; God (el) worship,is in their midst, so they have not known Yahweh. 5 The pride of Israyl testifies against him to his face, so Israyl and Ephraim will fall in their iniquity, and Yahdah will also fall with them. 6 They will go with their flocks and their herds to seek Yahweh, but they will not find Him; He has withdrawn Himself from them. 7 They have dealt treacherously against; attempted to deceive and betray, Yahweh, for they have begotten strange children; through adultery of God (el) worship. Now their own new moon festivals will devour them, with their inheritance. 8 Blow the ram’s horn; shofar, in Gibeah, the trumpet; chatsotserah, in Ramah! Sound the alarm at Beth Awen! We are behind you, O Benyamin! 9 Ephraim will be desolate in the day of rebuke; among the tribes of Israyl I have revealed that which will surely be. 10 The leaders of Yahdah are like those who move boundary stones; I will pour out My wrath over them like water. 11 Ephraim is oppressed, broken in judgment, because he willingly walked after the commandments of men. The seven million Sabbath keepers that the roman catholic church murdered at the hands of Adolf Hitler, a ‘Jew’ himself, were only a drop in the ocean of the billions worldwide that have been slaughtered by this rebellious system. You could read for the rest of your life and never cover all of the history of these murders, even in America. The roman catholic church now wants to resurrect the so-call ‘holy’ roman empire. The following articles tell the story. Russian and the U.S. have enough nuclear power to darken the sun, but there are nine other nations that are also fully loaded. The vatican popes want to resurrect the roman empire. But this time, the late Malachi Martin showed clearly in his book, The Keys to this Blood, that they intend to make war against all forms of Holiness and completely wipe out those who practice Holiness. The Keys of this Blood shows that the roman catholic church was the priesthood of which Aaron, the brother of Mosheh, was chief priest. But there again, they deceive because they reject the Laws of Yahweh given through Mosheh. They are the priesthood of Satan, who rebelled against Yahweh’s Priest Samuyl, the chief Priest who sat in Mosheh’s seat judging the twelve tribes of Israyl. The popes are still known by their fruits of evil. Their plans are to eliminate all Holiness from the earth. Their statement is to depopulate the earth of all those who will not worship Mary. The deception is to have you believe that Mary would be the mother of the Messiah, Yahshua. For complete details about the queen of heaven, we recommend the book, Unveiling Satan, Her True Identity Revealed. Fantastic information is presented in that book. No one can fully understand the Scriptures without the information found in that book. Yahweh does have, in these Last Days, a Protected Place set up to protect those who will come out of this world in this generation and learn Yahweh’s Righteousness at His House. Ask for information about the Protected Place in Prophecy. The roman catholic church and all nations still carry in each character the cause for confusion, hatred, fighting, and wars. Malachi Martin said the vatican hopes to come out on top in this planned new world order of the resurrected roman empire. The United State and Russia also hope to become the world rulers. Russia is like a teddy bear at this time, said Martin in a 1995 interview, but she could turn into a grizzly overnight. Russia and the United States alone have enough nuclear power to destroy all life on earth ten times over. Remember this: the Inspired Writings of Yahweh’s Prophets told us, in advance, over 2000 years ago, what we would see in this generation. This proves the Prophecies True. 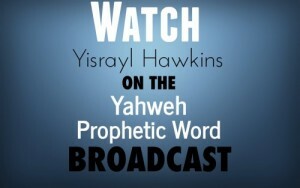 Notice what Daniyl says about those who become wise in Yahweh’s Righteousness. And those who are wise will shine as the brightness of the heavens; and those who turn many to Righteousness, as the stars forever and ever. That also means getting yourself ready to come to the Protected Place. Yahweh is your ONLY protection. Ask for the shadow of protection. The cause for another and even greater holocaust is the strongest ever in this last and present, prophesied generation.